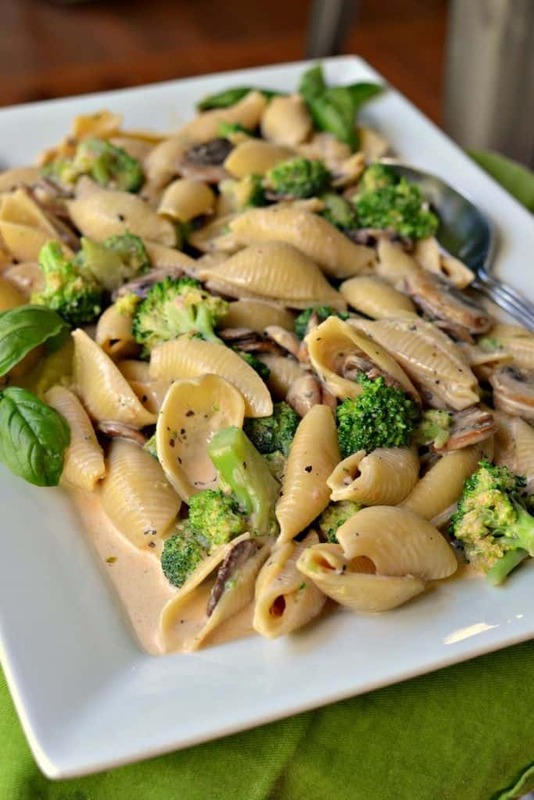 Pasta con Broccoli is the ultimate pasta lovers dream with broccoli, mushrooms, and garlic smothered in a rich Parmesan cream sauce with a touch of tomato sauce. The final result is a match made in heaven. Are you a big pasta lover? My family certainly is so having a repertoire of delicious pasta recipes is a requirement. Not only does it have it be delectable but it has to be easy and fast. This fabulous dish can be on the table in less than 30 minutes if you cook the pasta at the same time. It works out best that way because then every thing is warm and fresh. Now I know not all of you are mushroom lovers but don’t toss the baby out with the bath water. How to make Pasta con Broccoli. First cook the pasta but the in last couple of minutes of cooking throw in the broccoli. Make sure you drain it well. Meanwhile add the butter to a skillet and cook the mushrooms until they start to turn golden brown. Then add the garlic and sweet basil. Pour in the cream and cook until it starts to thicken. Slowly stir in the Parmesan cheese. Stir in the tomato sauce and season with salt and pepper to taste. 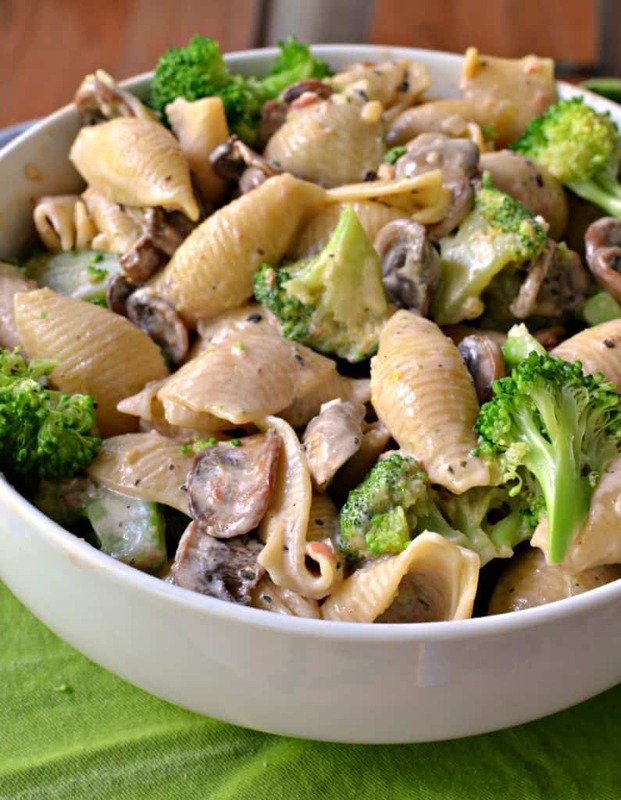 Finally return the broccoli and mushrooms back to the skillet and stir to coat. Use heavy cream with this recipe. It reduces best and makes the finest pasta sauce. If you must use half and half or milk than you will need to thicken it with a bit of cornstarch and cool water. About two tablespoons of cornstarch mixed with two tablespoons of water will do the trick. Don’t overcook the broccoli. You don’t want it mushy. It is best with a little bit of crisp for this pasta. Don’t overcook the pasta. It is placed back over the heat in the final step to warm everything up so that will add 1-2 minutes to the cooking time. Always turn heat to medium low to cook garlic and a little less than a minute is all it needs. Burn’t garlic is bitter and it will change the overall taste of your dish and not for the good. Use the amount of red sauce that pleases your palate. 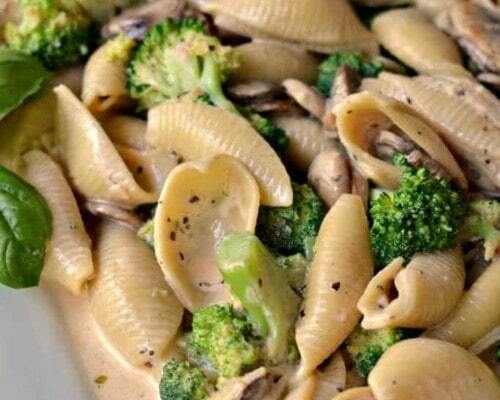 I personally like my Pasta con Broccoli more white than red so I go light. This pasta is a full meal in itself. If you really want to serve something with it perhaps a small grilled beef filet or Italian sausage and/or a crusty french baguette. Make sure you try it. It is delicious, easy and dependable. You might even get your kids to try broccoli. Other pasta recipes you will love! 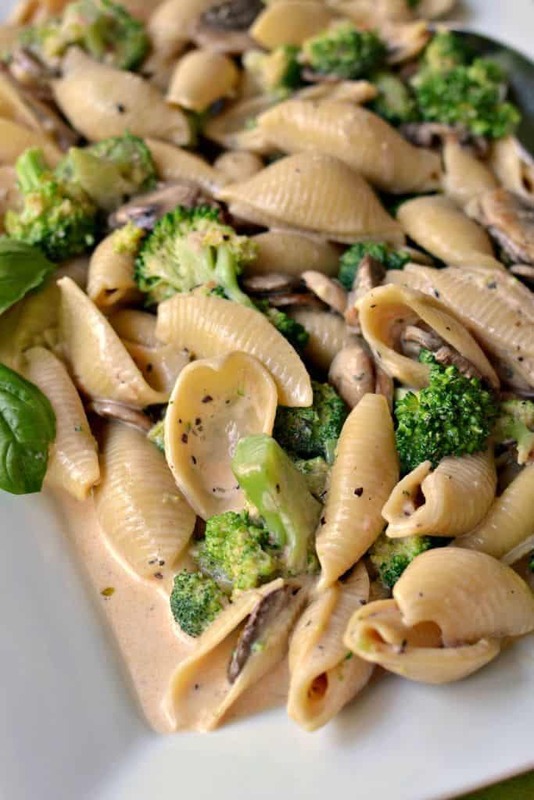 Pasta con Broccoli is the ultimate pasta lovers dish with broccoli, mushrooms, and garlic smothered in a Parmesan cream sauce with a touch of tomato sauce. Boil pasta according to package instructions adding the broccoli the last 2-3 minutes of cooking. Drain well in colander. In large skillet melt butter over medium high heat. Add mushroom and cook until light golden brown. Reduce heat to medium low; add garlic and basil and cook for 1 minute stirring continuously. Add cream and cook until slightly thickened and reduced; approximately 15 minutes. Slowly stir in Parmesan cheese. Stir in tomato sauce and season with salt and pepper to taste. Return broccoli and pasta to pan and heat through. This looks really delicious! I can’t wait to try it. Thanks so much! I hope you enjoy it!